English, Edward VI, AD 1547 to 1553. Silver Crown. Denomination : Silver crown. Mint : London. Date : Initial mark "Y", dated 1551. Size : 40.5 x 41.5 mm. Weight : 30.22 grams. Grade : Good (well worn, but evenly so, and while muted nearly everything is visible). 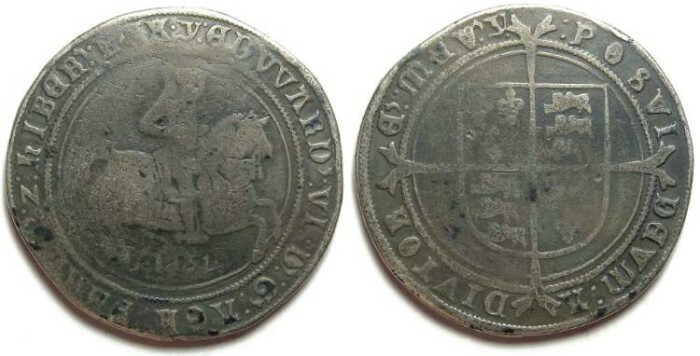 Obverse : Edward on horseback right, with the date 1551 below (all four digits can be read although the first two are weak), with EDWARD VI D G AGA FRANC Z hIBER REX around. Reverse : Long cross over a shield, with POSVI DEVM ADIVTORE MEV (Latin for I HAVE MADE GOD MY HELPER).